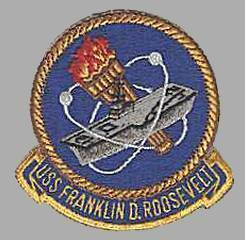 Tactical Voice Radio Call: "RIPTIDE"
Renamed Franklin D. Roosevelt, 8 May 1945, after Franklin Delano Roosevelt (1882–1945), 32nd President of the United States of America (1933–1945), who had died one month earlier. Assuming the Presidency at the depth of the Great Depression, Mr. Roosevelt helped the American people regain faith in themselves. He later sought to keep the United States out of the war in Europe, yet at the same time to strengthen nations threatened or attacked. When France fell and England came under siege in 1940, Roosevelt (who had been Assistant Secretary of the Navy under President Wilson) began to send Great Britain all possible aid short of actual military involvement. When the Japanese attacked Pearl Harbor on December 7, 1941, Roosevelt directed organization of the Nation's manpower and resources for global war. Feeling that the future peace of the world would depend upon relations between the United States and the Soviet Union, he devoted much thought to the planning of a United Nations, in which, he hoped, international difficulties could be settled. 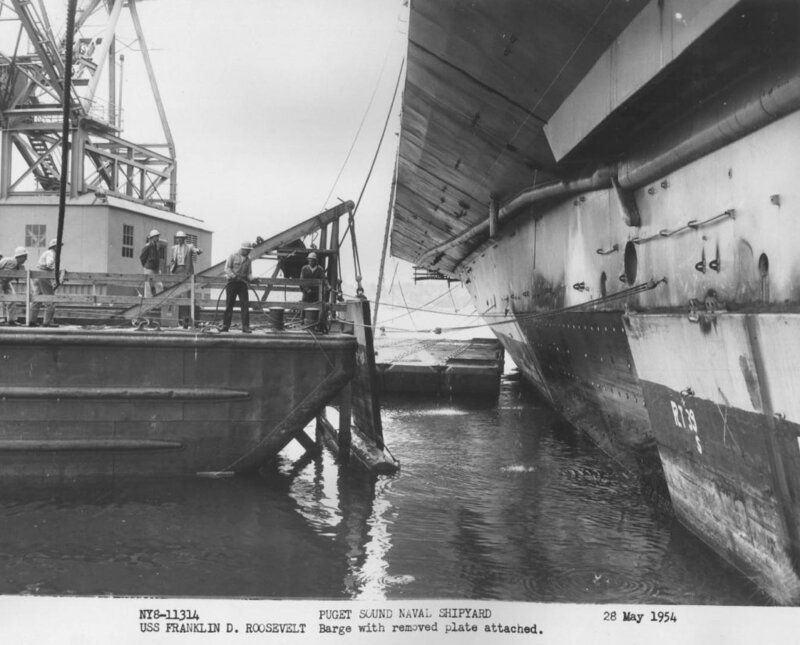 Puget Sound Naval Shipyard, 28 May 1954. Barge with removed plate attached. (Photo # NY8-11314). Seattle Branch of the National Archives photo. 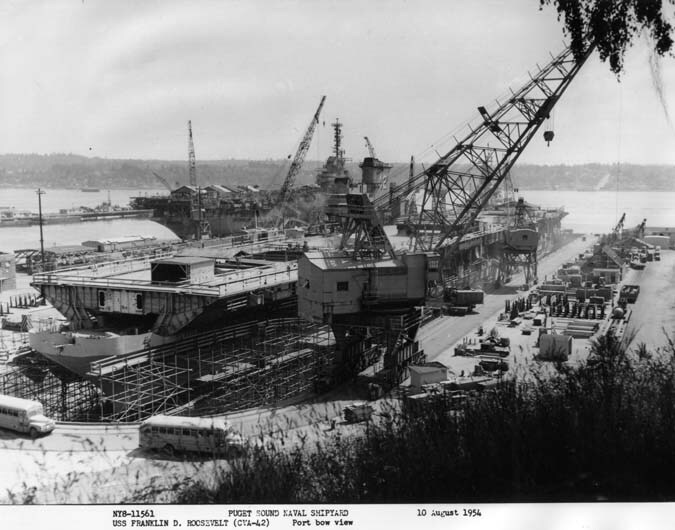 Puget Sound Naval Shipyard, 10 August 1954. 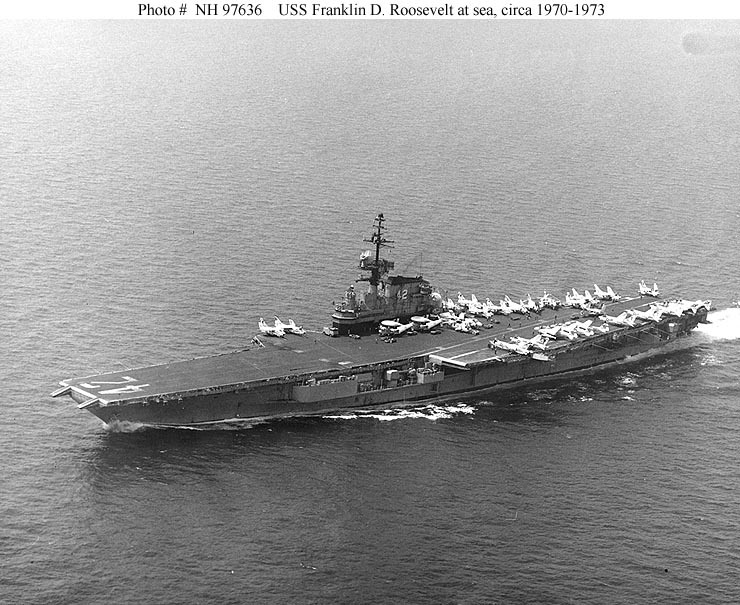 USS Franklin D. Roosevelt (CVA-42) getting her hurricane bow (Photo # NY8-11561). Puget Sound Naval Shipyard, 20 October 1954. 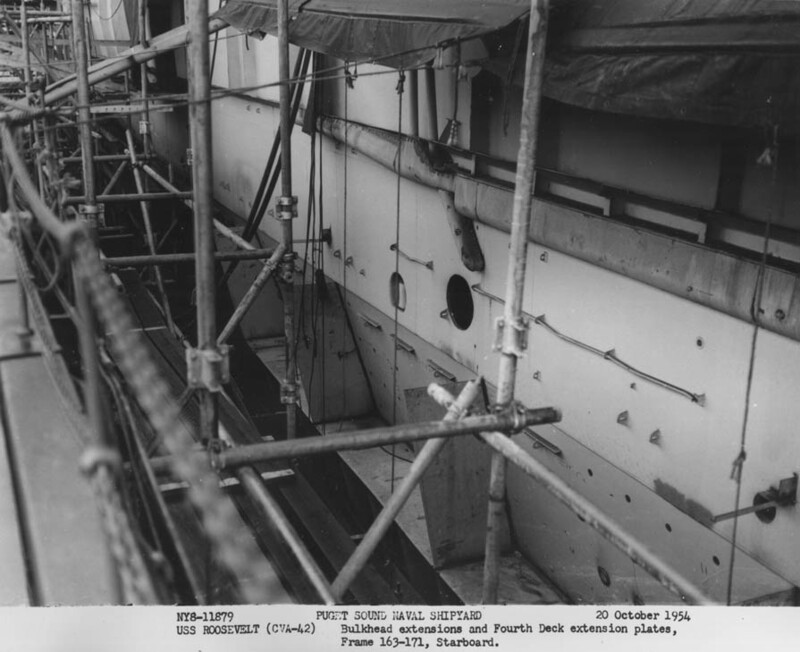 Bulkhead extensions and Fourth Deck extension plates, Frame 163–171, Starboard. (Photo # NY8-11879). 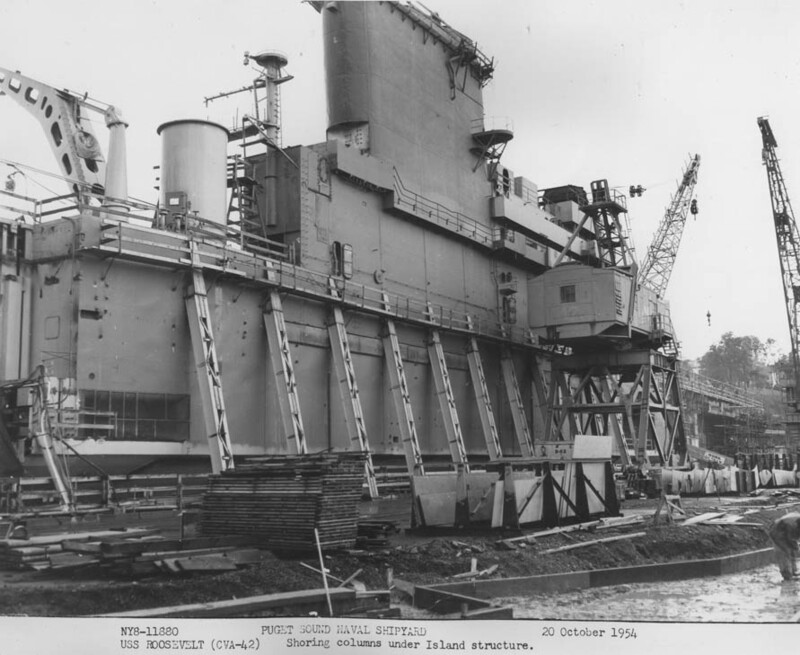 Puget Sound Naval Shipyard, 20 October 1954. Shoring columns under Island structure. (Photo # NY8-11880). 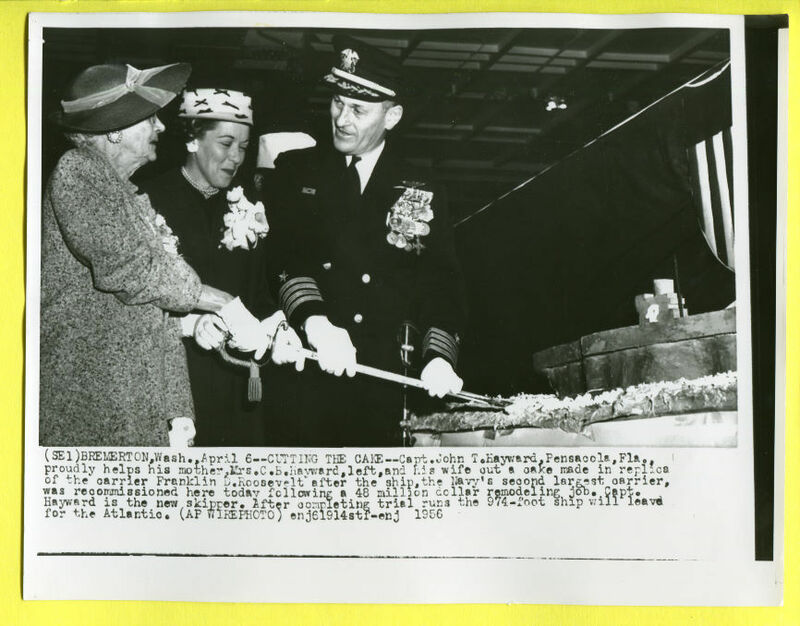 "(SE1)BREMERTON, Wash., April 6[, 1956]—CUTTING THE CAKE—Capt. John T. Hayward, Pensacola, Fla., proudly helps his mother, Mrs. C.B. Hayward, left, and his wife cut a cake made in replica of the carrier Franklin D. Roosevelt after the ship, the Navy's second largest carrier, was recommissioned here today following a 48 million dollar remodeling job. Capt. Hayward is the new skipper. After completing trial runs the 974-foot ship will leave for the Atlantic. 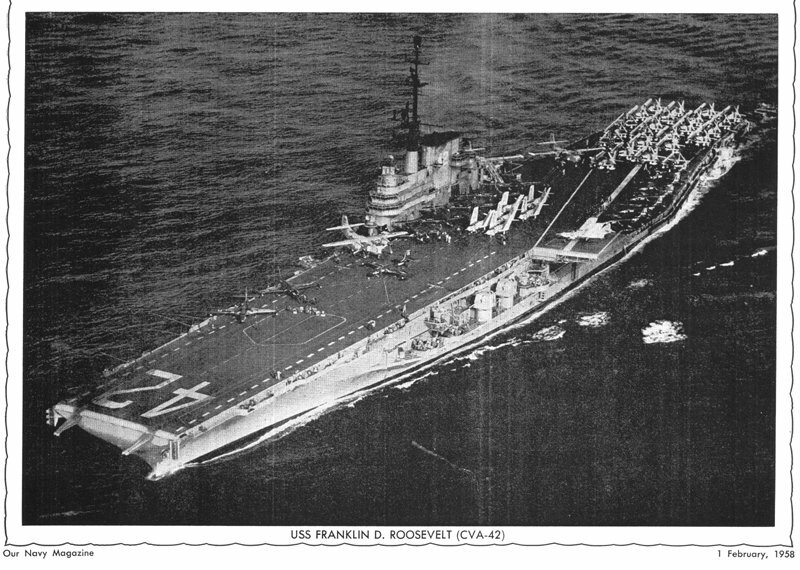 (AP WIREPHOTO) enj61914stf-enj 1956"
USS Franklin D. Roosevelt (CVA-42), from Our Navy magazine, 1 February, 1958. 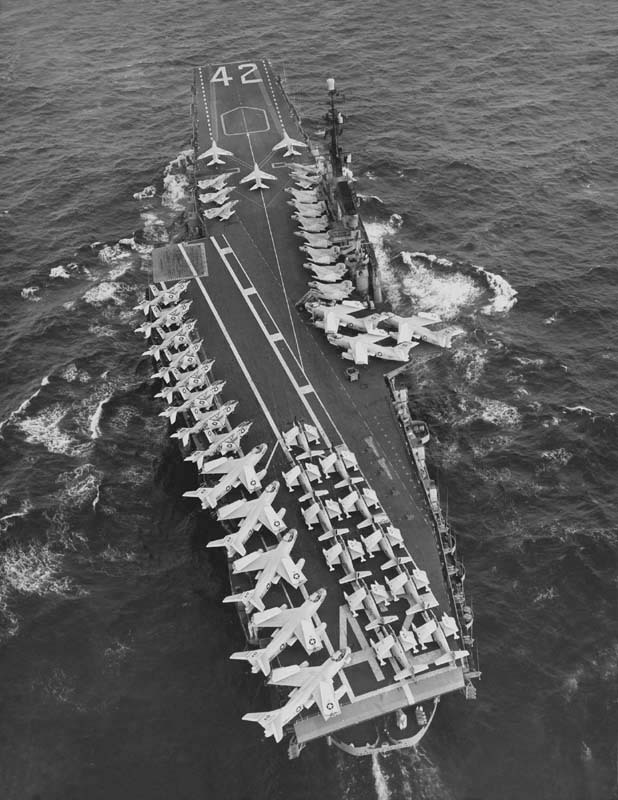 Photo taken in 1956-1957, with Carrier Air Group 17 (CVG-17) aboard. Note mixture of color schemes: some aircraft were painted in the new light gull gray over glossy insignia white scheme (as directed by MIL-C-18263, 23 February 1955) while others were still painted in the old overall glossy sea blue scheme. 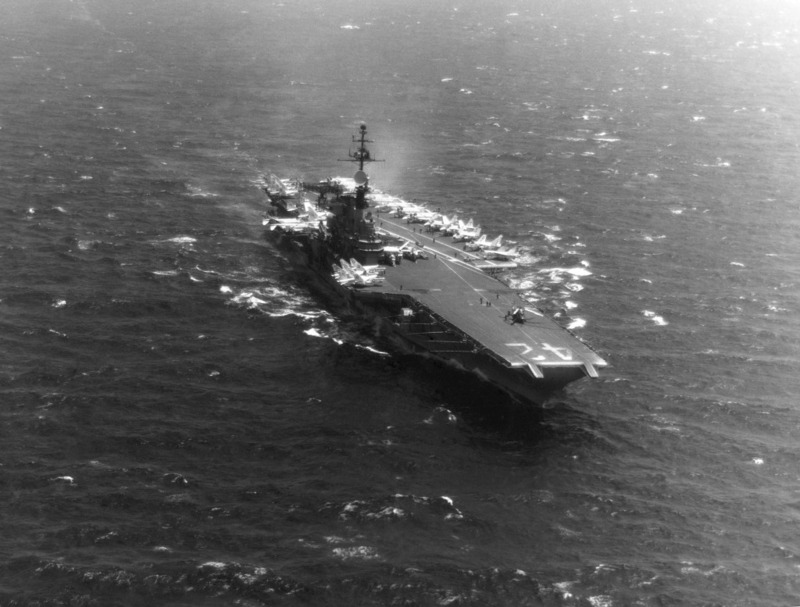 Underway, 26 September 1956, after her two-year SCB-110 modernization. 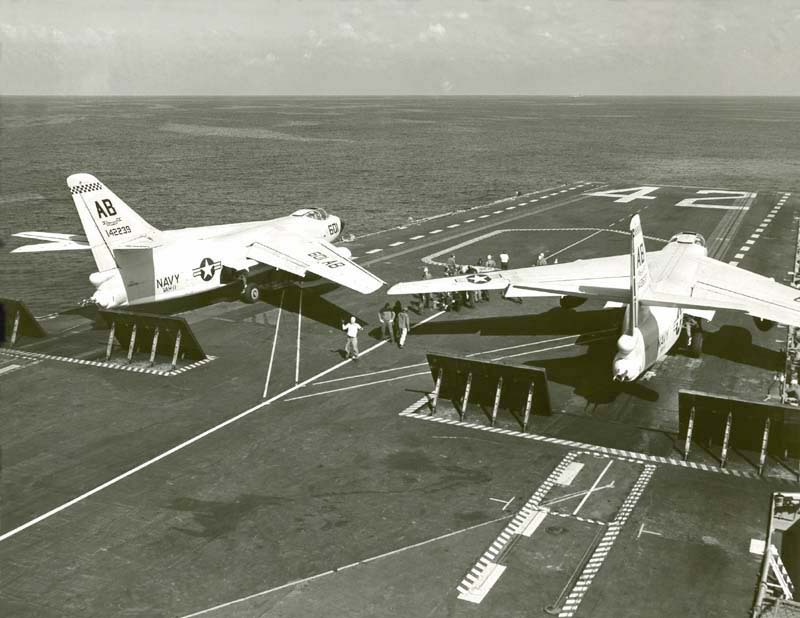 FDR conducted Air Wing training and other CarQuals from Mayport, Fla., 9 Aug–25 Oct 1956. 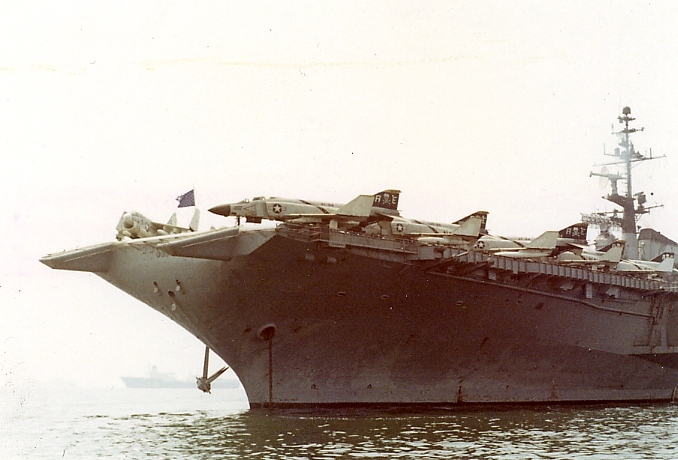 SCB-110 included the installation of the angled flight deck and three type C-11 steam catapults (that fitted to the angled deck was later removed). Although the number of 5"/54 Mk.39 and 3"/50 guns was reduced, she retained a considerable gun battery. New SPS-8A and SPS-12 radars were carried on the new mast, and an old SC-2 was retained behind the funnel (see NS024214). (Thanks to Robert Hurst, who provided additional info). 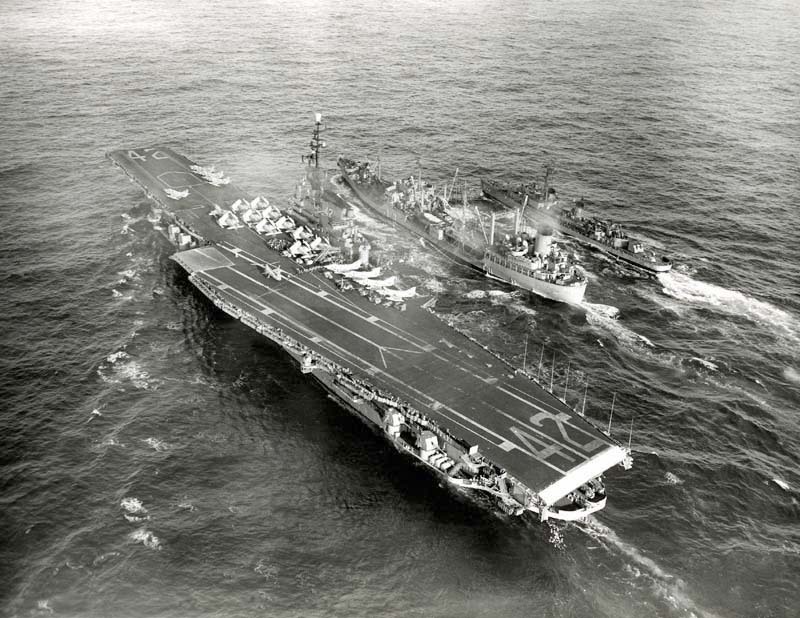 USS Gainard (DD-706) alongside USS Franklin D. Roosevelt (CVA-42) on 15 December 1957 (photo # CVA-42-4035). 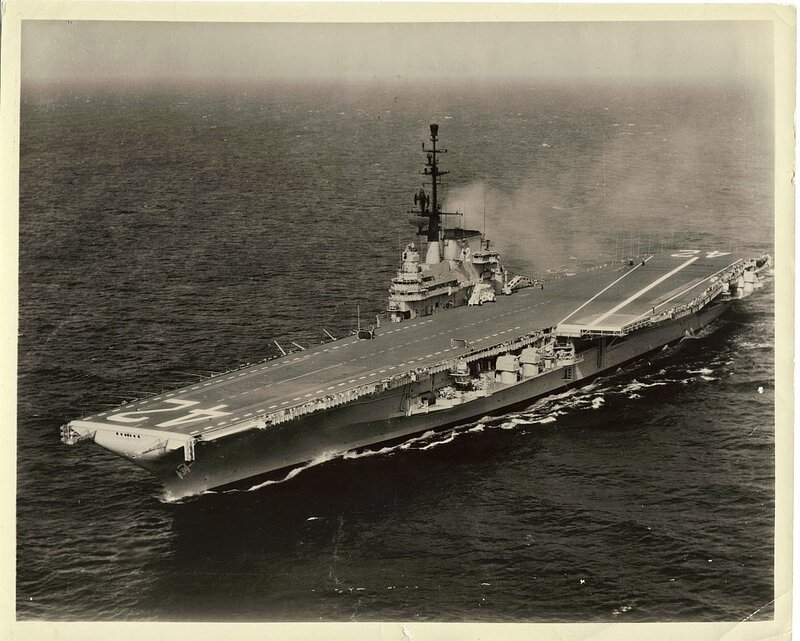 From the collection of John L. Slade who was Captain of the Gainard in 1957–1959. 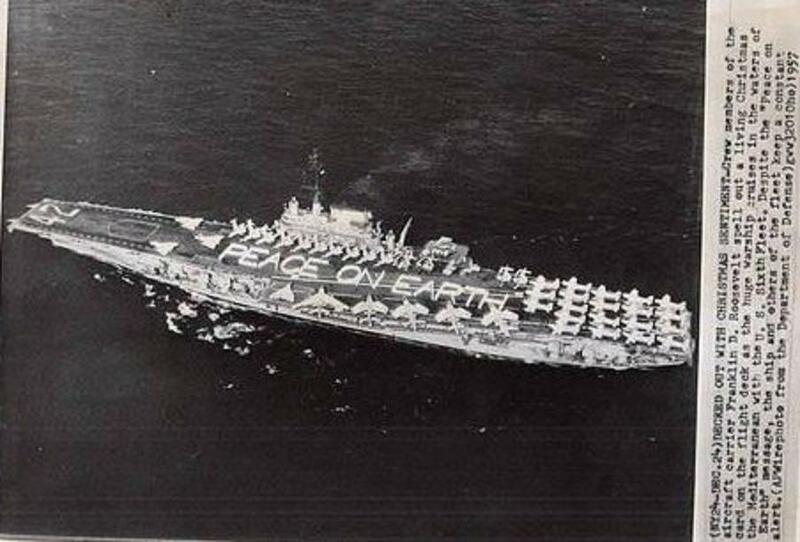 "(NY24-DEC.24)DECKED OUT WITH CHRISTMAS SENTIMENT—Crew members of the aircraft carrier Franklin D. Roosevelt spell out a living Christmas card on the flight deck as the huge warship cruises in the waters of the Mediterranean with the U.S. Sixth Fleet. Despite the 'Peace on Earth' message, the ship and others of the fleet keep a constant alert. (APWirephoto from the Department of Defense)" 24 December 1957. 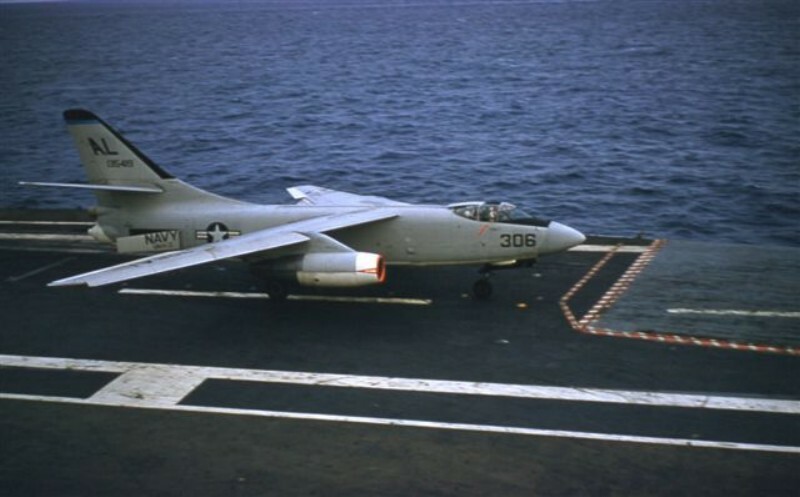 A Douglas A3D-1 Skywarrior (BuNo 135429) of Heavy Attack Squadron VAH-3 "Sea Dragons" landing aboard USS Franklin D. Roosevelt (CVA-42) during the carrier's deployment to the Mediterranean between 12 July 1957 and 5 March 1958. The aircraft wears the tailcode "AL" which was used for Carrier Air Group 17 (CVG-17) only during that deployment. Photo taken by Jim Mulligan, U.S. Navy. 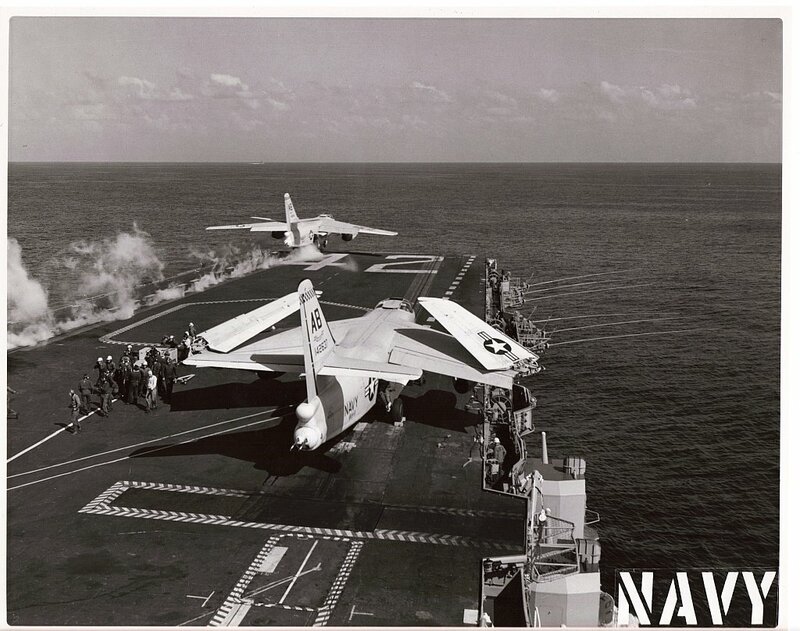 Three months after returning from this Mediterranean cruise, the "Sea Dragons" moved to NAS Sanford, FL, to be merged with the Atlantic Fleet's Heavy Attack Training Unit and took over a new role as the A3D/A-3 Replacement Air Group (RAG) for the Atlantic Fleet. 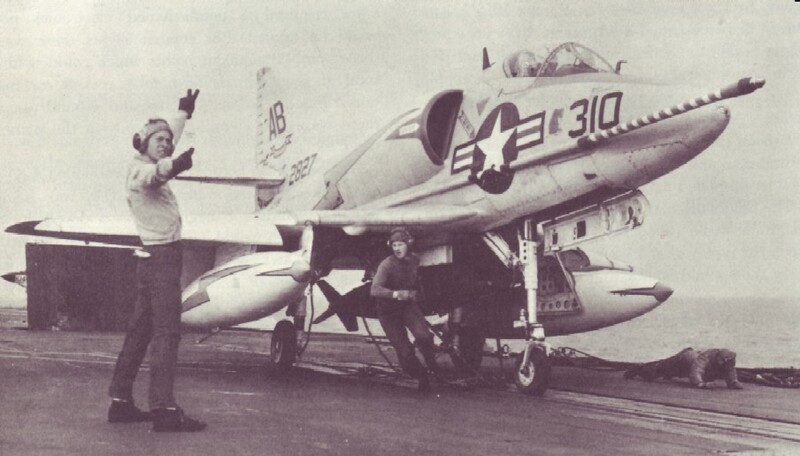 A Douglas A3D-1 Skywarrior (BuNo 135442) of Heavy Attack Squadron VAH-3 "Sea Dragons" aboard USS Franklin D. Roosevelt (CVA-42), probably during the carrier's deployment to the Mediterranean between 12 July 1957 and 5 March 1958. This particular aircraft was lost in an accident in March 1963. 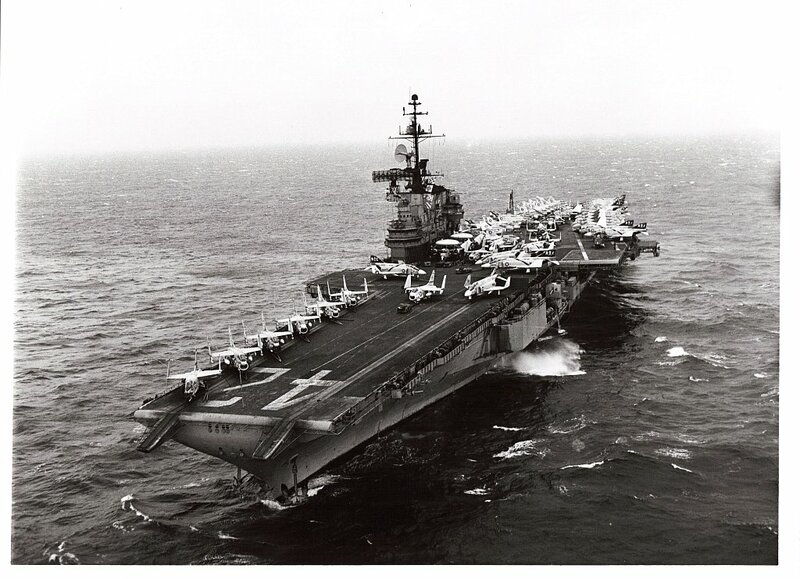 Aircraft of Carrier Air Group (CVG) 17 on the aircraft carrier USS Franklin D. Roosevelt (CVA-42) during that carrier's deployment to the Mediterranean between July 1957 and March 1958. A Douglas F4D-1 Skyray (BuNo 134870) fighter of Fighter Squadron (VF) 74 "Be-Devilers" is visible on the right. 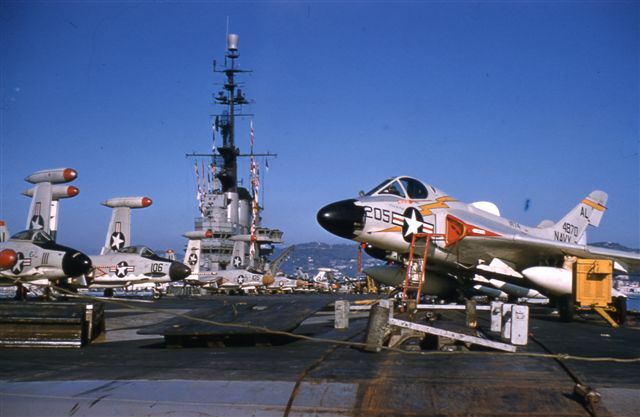 The planes on the left are McDonnell F2H-3 Banshee fighters of VF-171 "Aces." The aircraft wear the tailcode "AL" which was used for CVG-17 only during that deployment. US Navy photo by Jim Mulligan. Maintenance on a APQ-50A radar of a Douglas F4D-1 Skyray (BuNo 134870) fighter of Fighter Squadron (VF) 74 "Be-Devilers," Carrier Air Group (CVG) 17, on the aircraft carrier USS Franklin D. Roosevelt (CVA-42) during that carrier's deployment to the Mediterranean between July 1957 and March 1958. 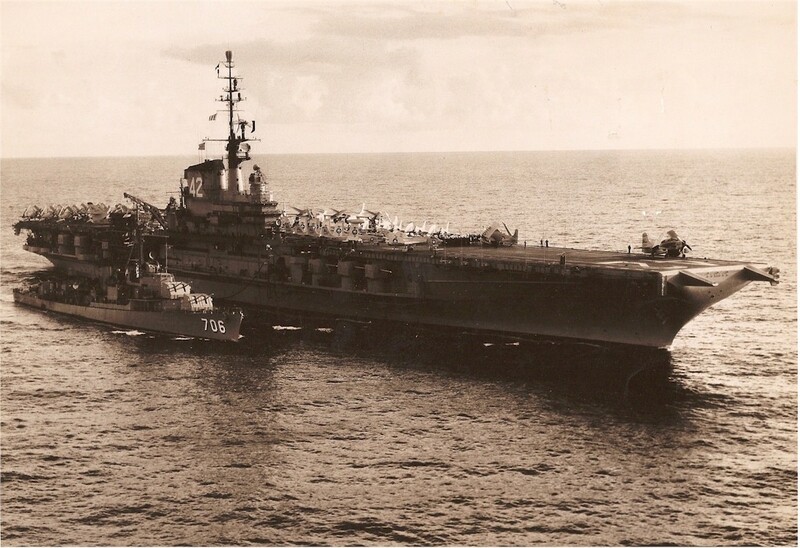 CVG-17 was assigned the tailcode "AL" only during this deployment. US Navy photo by Jim Mulligan. 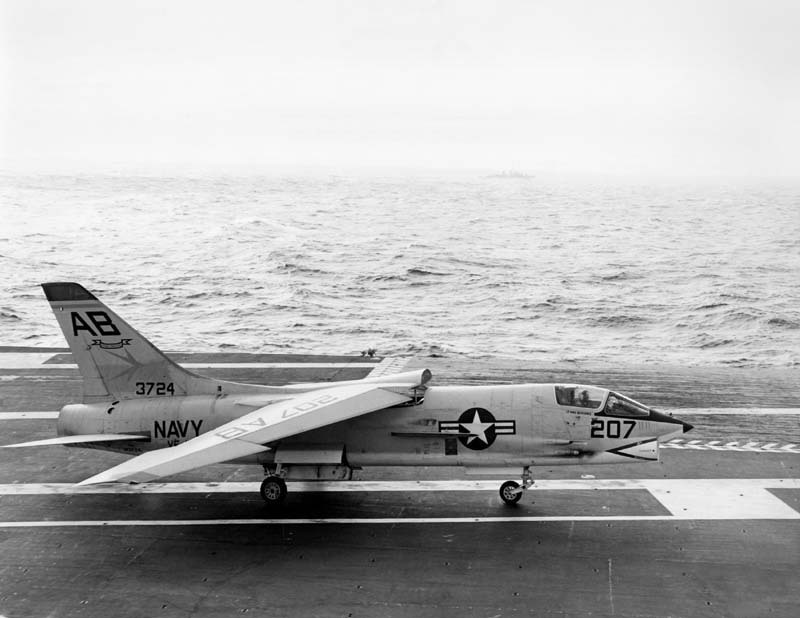 A Douglas A4D-2 (A-4B) Skyhawk about to be catapulted from the carrier USS Franklin D. Roosevelt[, circa 1959]. 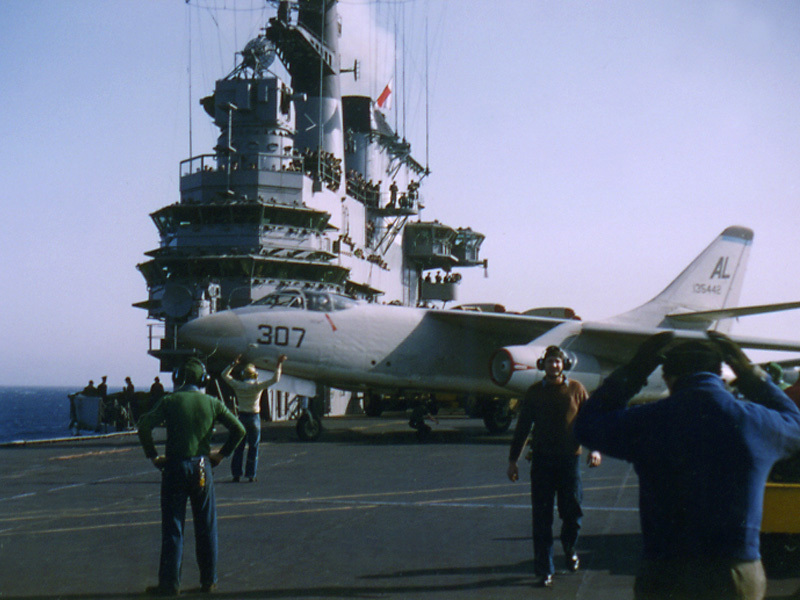 Note the A4D-2 has a fixed inflight refuelling probe on the starboard side. Photo U.S. Navy. 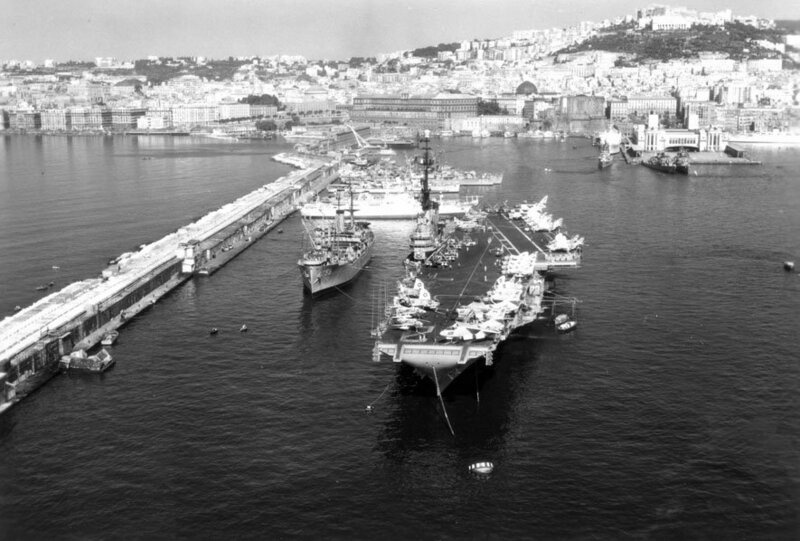 USS Denebola (AF-56) and USS Franklin D. Roosevelt (CVA-42) moored in the harbor at Naples, Italy in 1959. 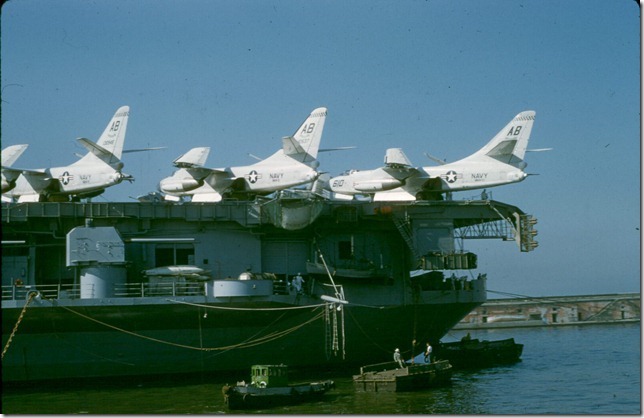 Three U.S. Marine Corps Douglas F4D-1 Skyray fighters of Marine All-Weather Fighter Squadron (VMF(AW)) 114 "Death Dealers" on the catapults of the aircraft carrier USS Franklin D. Roosevelt (CVA-42), in 1959. 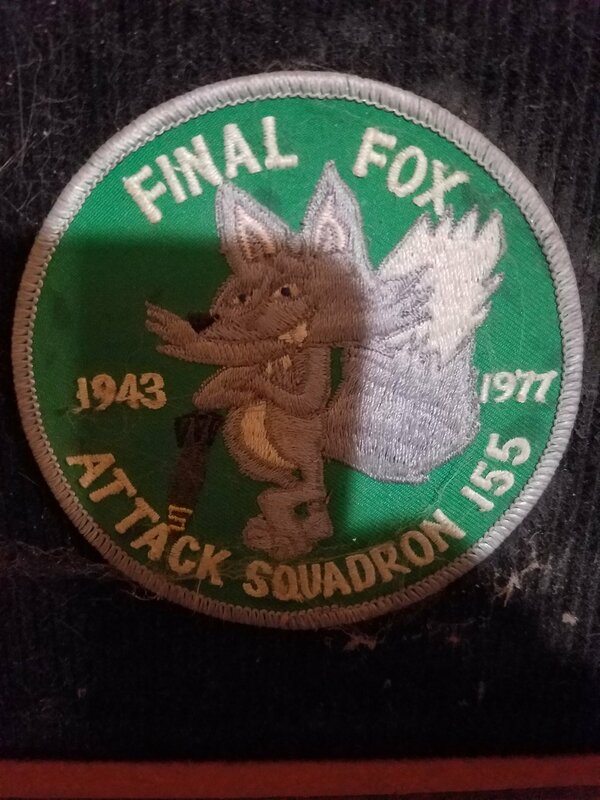 VMF(AW)-114 was assigned to Carrier Air Group (CVG) 1 aboard FDR for a deployment to the Mediterranean Sea from 13 February to 1 September 1959. Photo taken by Sgt. Harold (Woody) Woodrom, VMF(AW)-114, USMC. Naples, Italy, 1959. Taken from the Naples-to-Capri ferry. 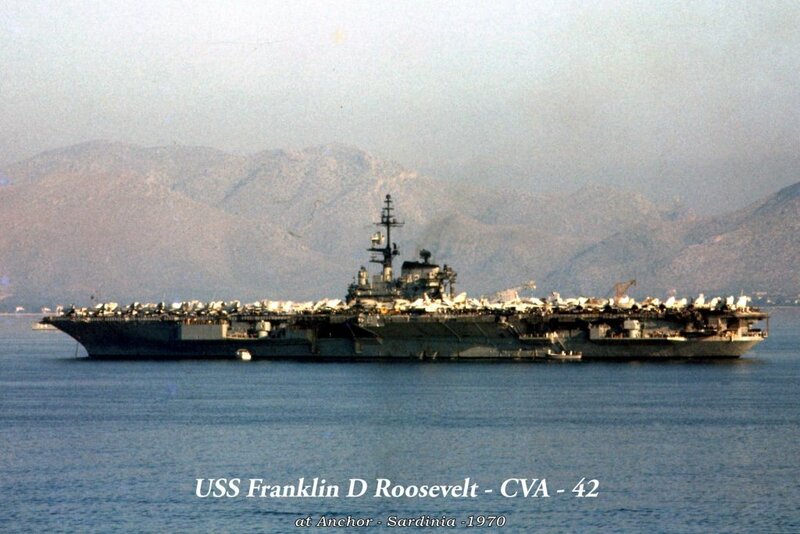 USS Franklin D. Roosevelt (CVA-42) was in port, Naples, 6–11 March, 13–18 March and 20 June–6 July (appear to have been taken on 4 July). NS024200: VAH-11 "Checkertails" A3D-2 Skywarriors. 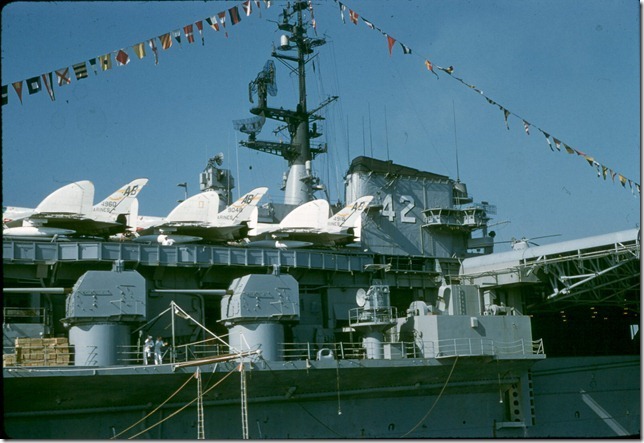 NS024200a: VMF(AW)-114 "Death Dealers" F4D-1 Skyrays. 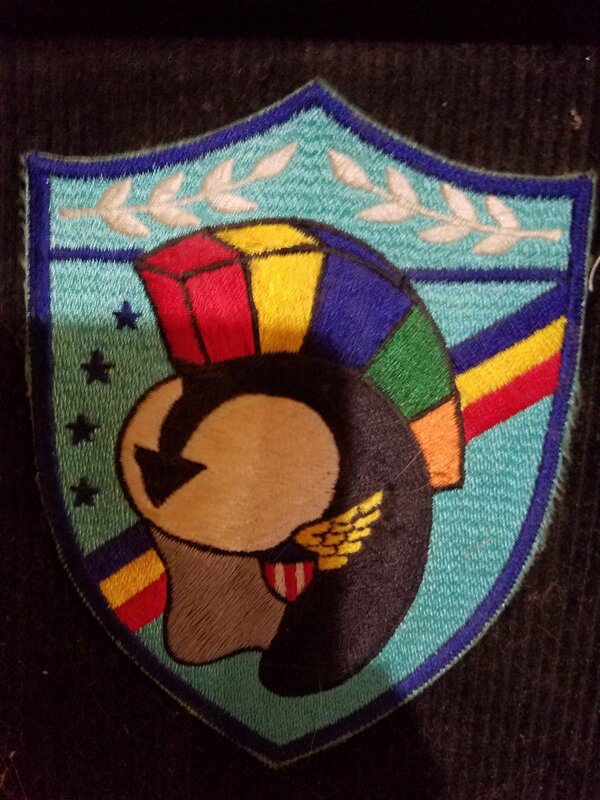 Carrier Air Group (CVG) 1, tail code "AB". 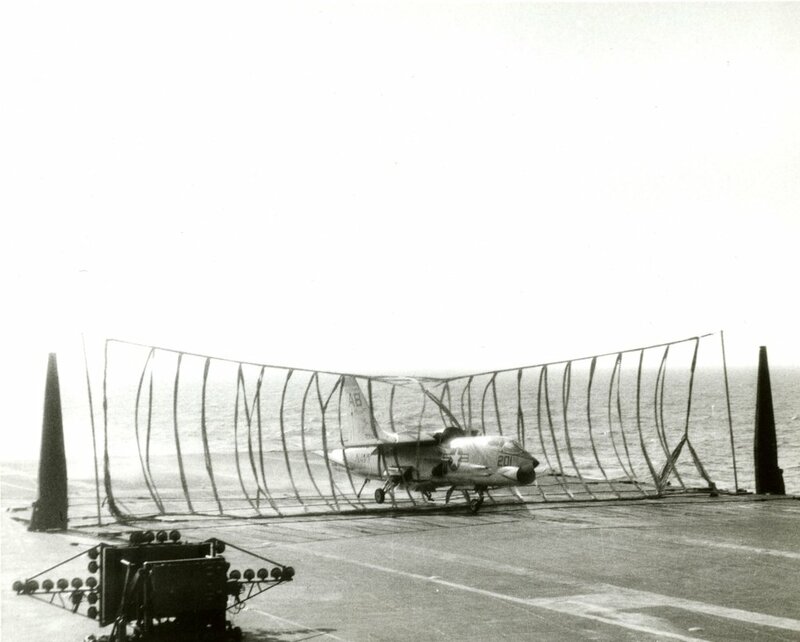 NS024245 91k In emergency situations a barricade is stretched across the carrier deck to stop aircraft unable to return safely aboard, or to available sites ashore. 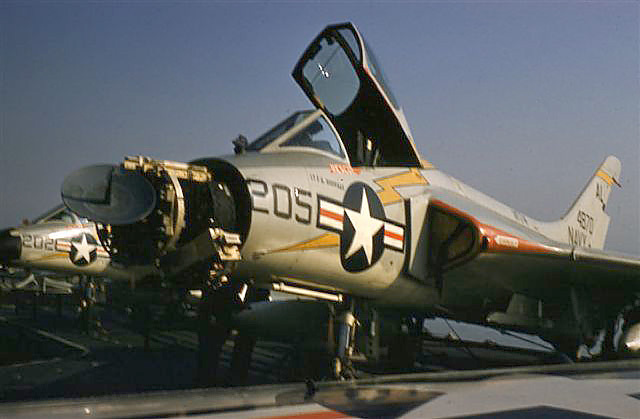 This is an F8U-1 Crusader of VF-11 "Red Rippers", BuNo 143716, modex AB-201, aboard USS Franklin D. Roosevelt (CVA-42), in 1960. Video clips: Two F8U landing accidents, 3 June 1960 & 21 October 1961. 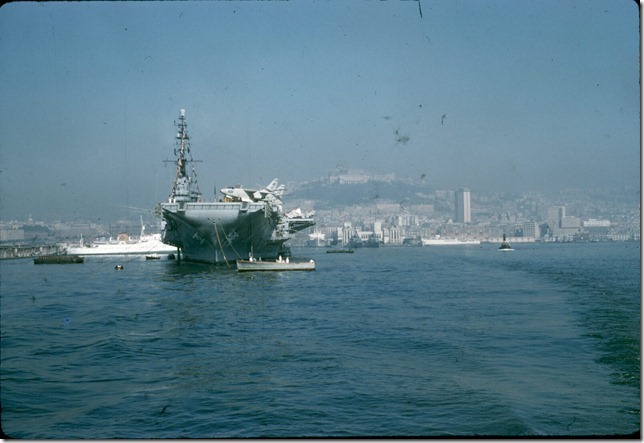 Videos courtesy of Larry Blumenthal, PH3, 1957–61 ("US Navy Photos"). Note: These videos do not reside on the NavSource server and will open in a separate window. Photo sequence: F8U landing accident, 21 October 1961. 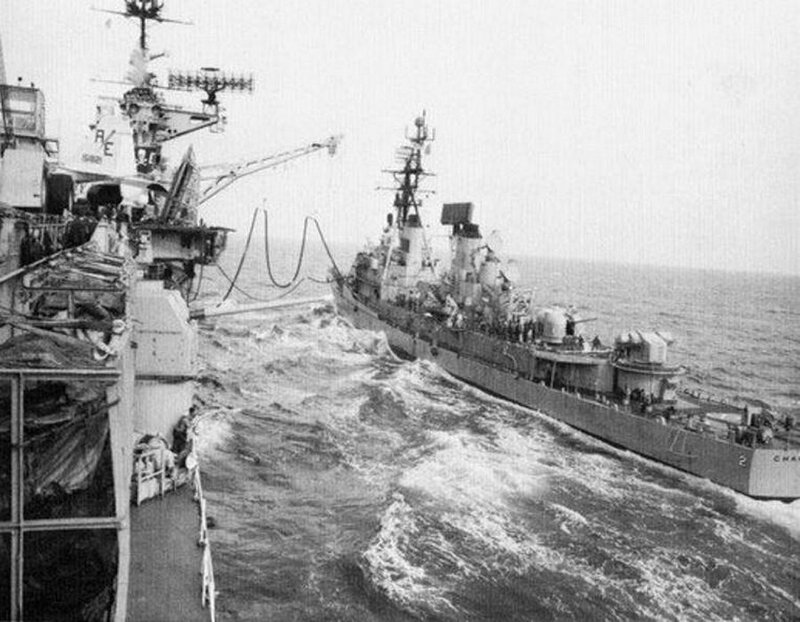 USS Franklin D. Roosevelt (CVA-42) refuels USS Charles F. Adams (DDG-2) somewhere in the Med, first half of the 1970s. Photographer unknown. Steve Graham, AT‑2, VA-176, 1972. 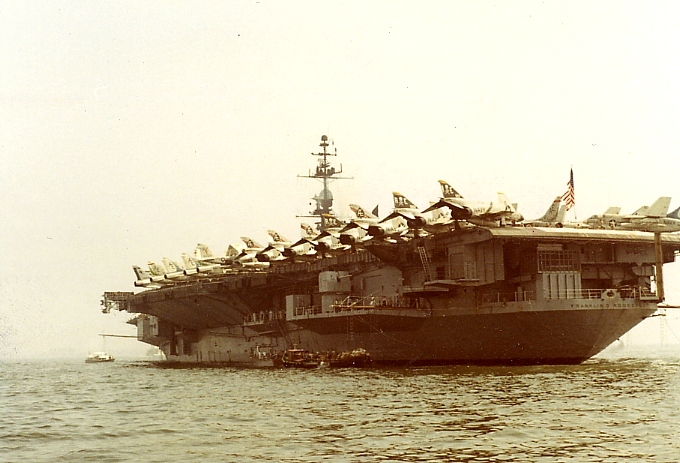 Naples Gulf, mid-1970, with Carrier Air Wing Six (CVW-6). Naples Gulf, mid-1970. Note the view ports for the secondary conning station (the seven port lights at the gallery deck level) and the "oil canning" effect on the hurricane bow plating caused from slamming into heavy seas. Naples Gulf, mid-1970. 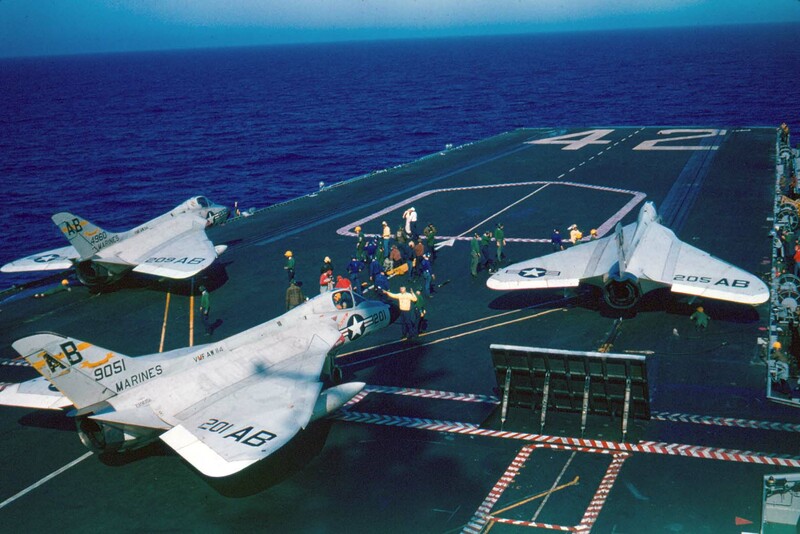 Five F-4J Phantom IIs assigned to the "Jolly Rogers" of VF-84 are visible on deck, along with an A-7B Corsair II. Naples Gulf, mid-1970. Clearly visible atop the island and mast are a Mk.37 GFCS, with Mk.25 radar; an SPS-30 height-finder; and an SPS-43 long-wave, long-range air search radar. 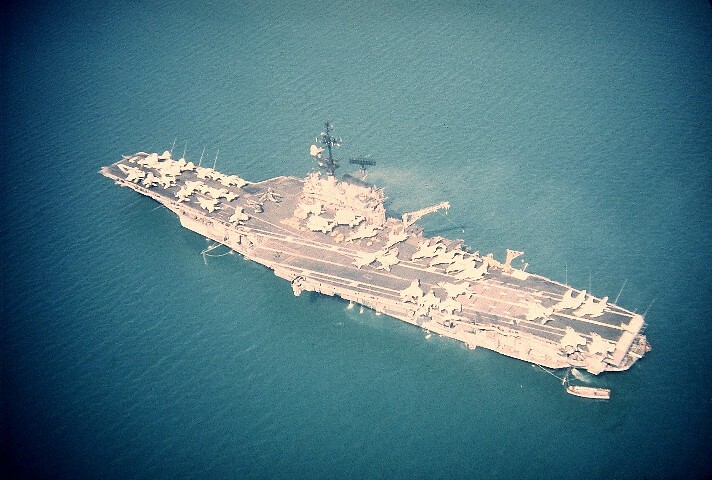 I took this photo from a helicopter returning to FDR at anchor in the Gulf of Taranto in mid-1970. 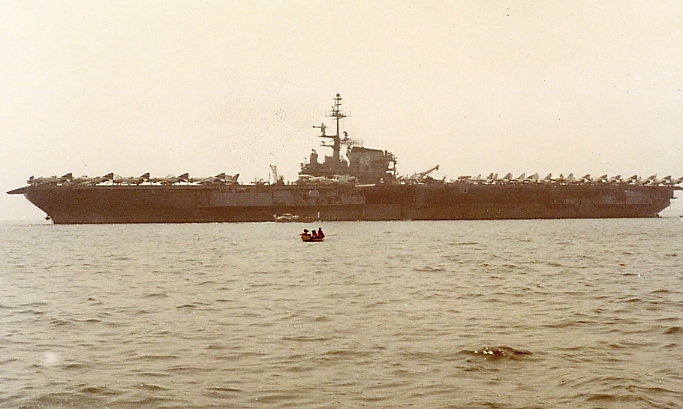 USS Franklin D. Roosevelt (CVA-42) at anchor off Sardinia, summer 1970. 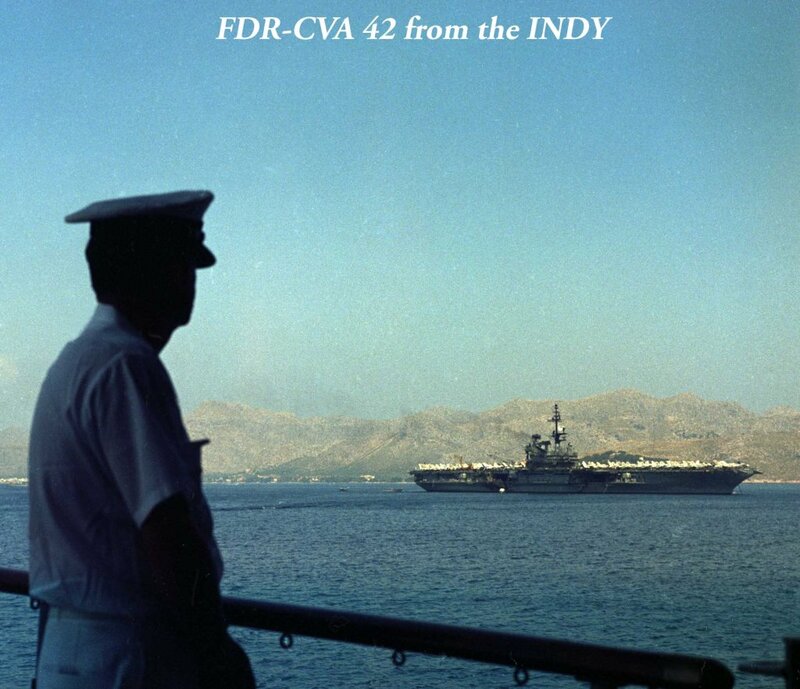 USS Franklin D. Roosevelt (CVA-42) at anchor off Sardinia, summer 1970, as seen from USS Independence (CVA-62). 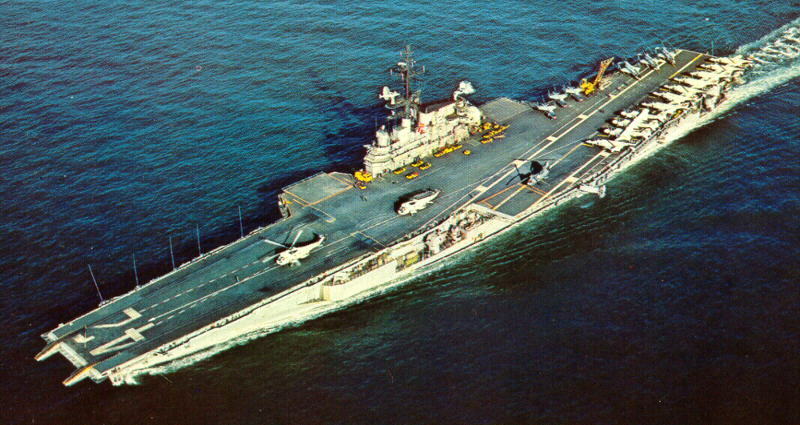 An aerial view, port bow, of USS Franklin D. Roosevelt (CVA-42) while underway in the Mediterranean Sea, probably between 29 January and 28 July 1971. 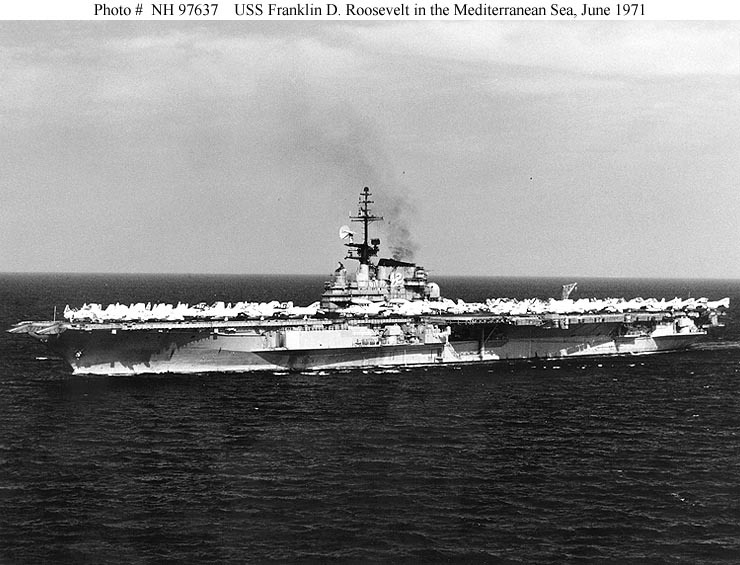 Underway in the Mediterranean Sea, 6 June 1971. Photographed by Ph2 W. Striegel. 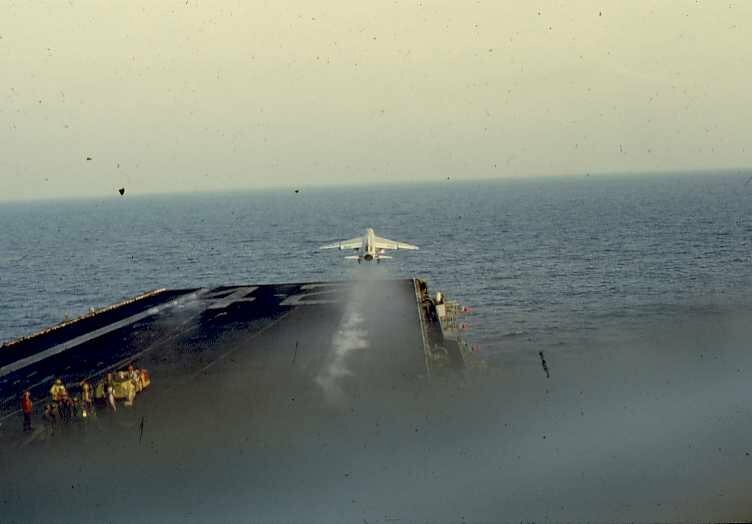 VA-176 "Thunderbolts" A-6A Intruder goes off the pointy end, Mediterranean, 1972. A VA-215 "Barn Owls" A-7B Corsair II awaits its turn. Steve Graham's photo. 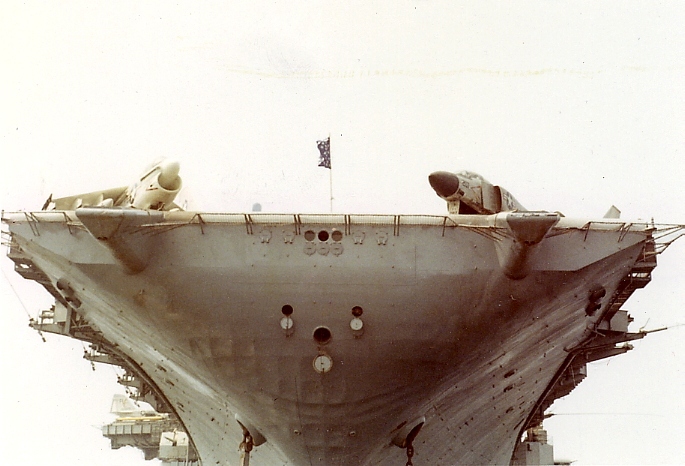 A-7B Corsair II launches from FDR's starboard catapult in the Med, 1972. 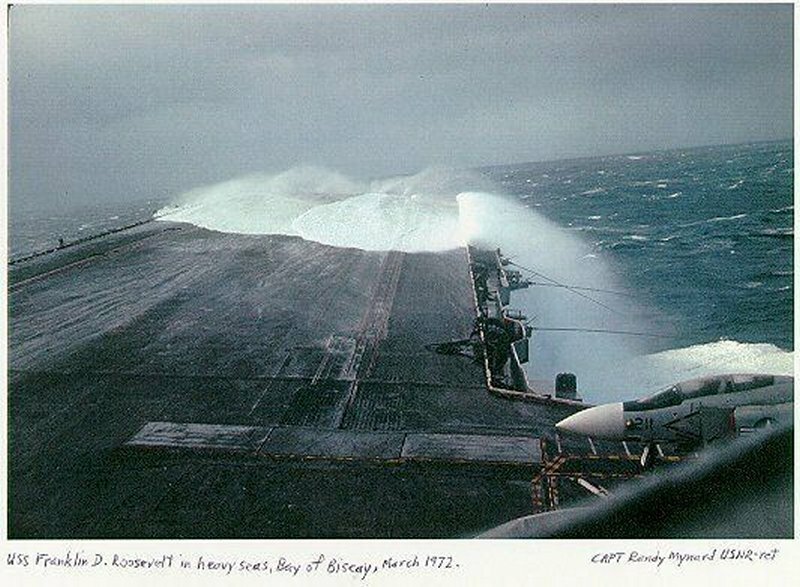 "USS Franklin D. Roosevelt in heavy seas, Bay of Biscay, [Feb–Mar] 1972. CAPT Randy Mynard USNR Ret." 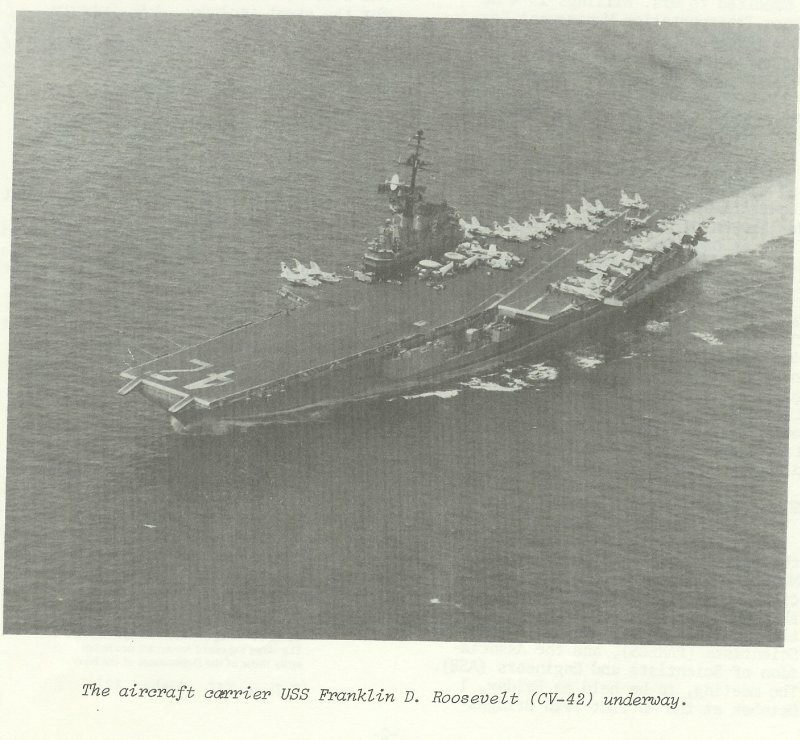 USS Franklin D. Roosevelt (CVA-42) underway. 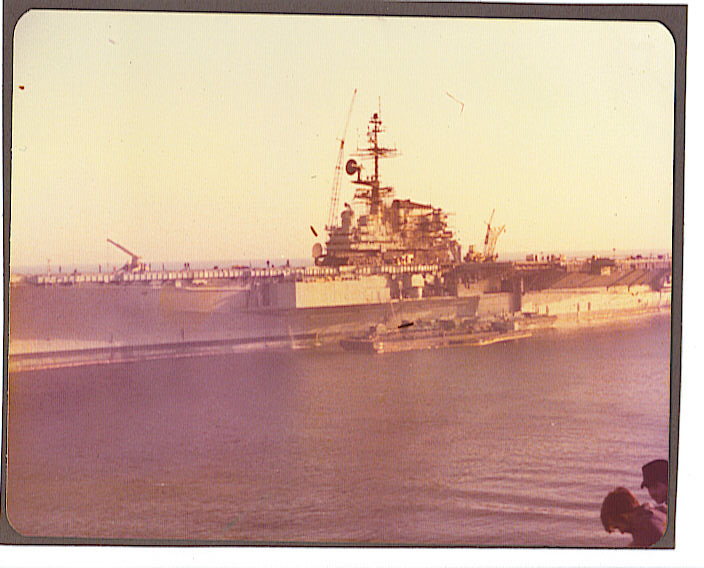 Official US Navy Photograph #1157465, received in October 1973 by the US Naval Photographic Center, Naval Station Washington DC. 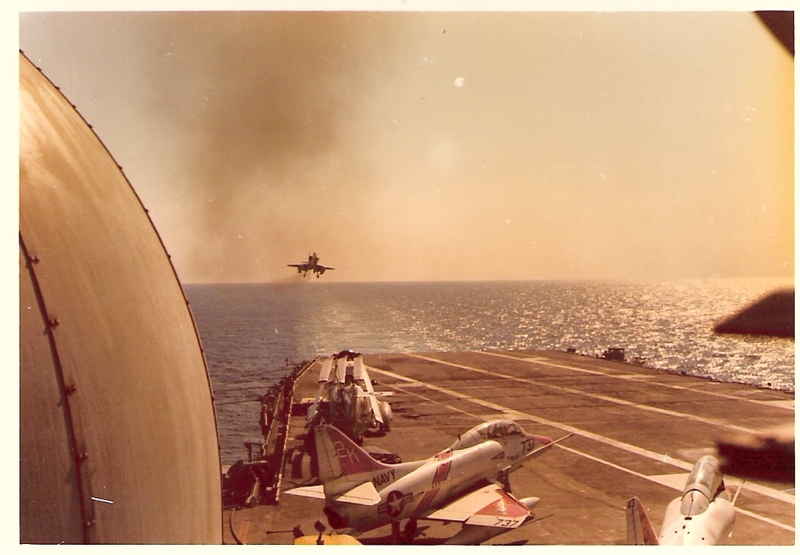 Judging from air wing composition, this picture appears to have been taken circa 1971. 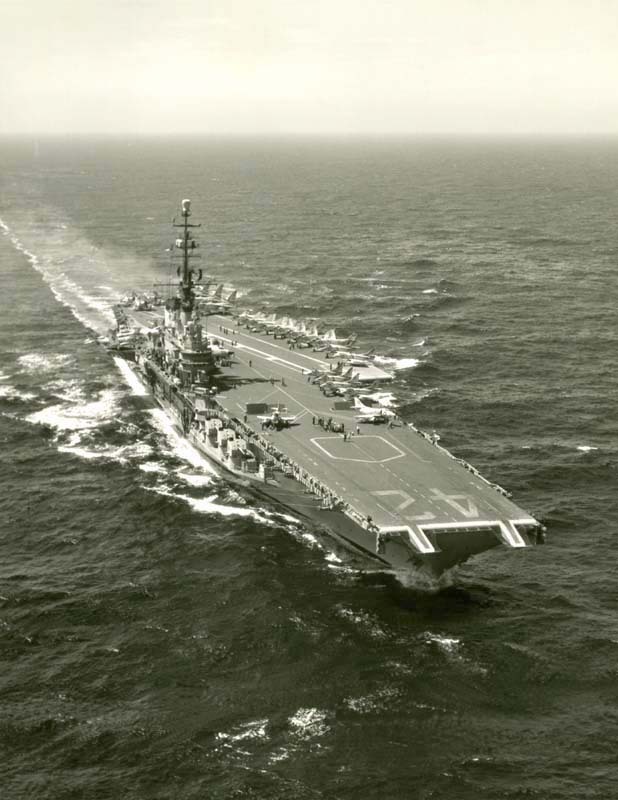 Underway at sea, circa 1970-73. 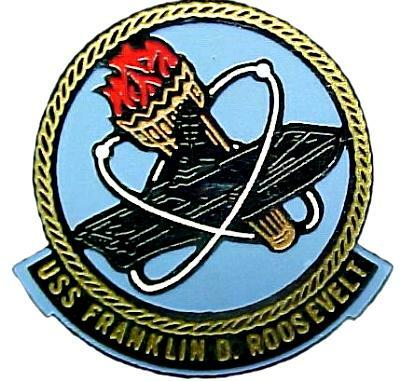 The original print accompanied a 26 January 1974 press release concerning the Meritorious Unit Commendation awarded to Franklin D. Roosevelt in recognition of her performance during a ten-month Sixth Fleet deployment, from 9 March to 1 December 1972. 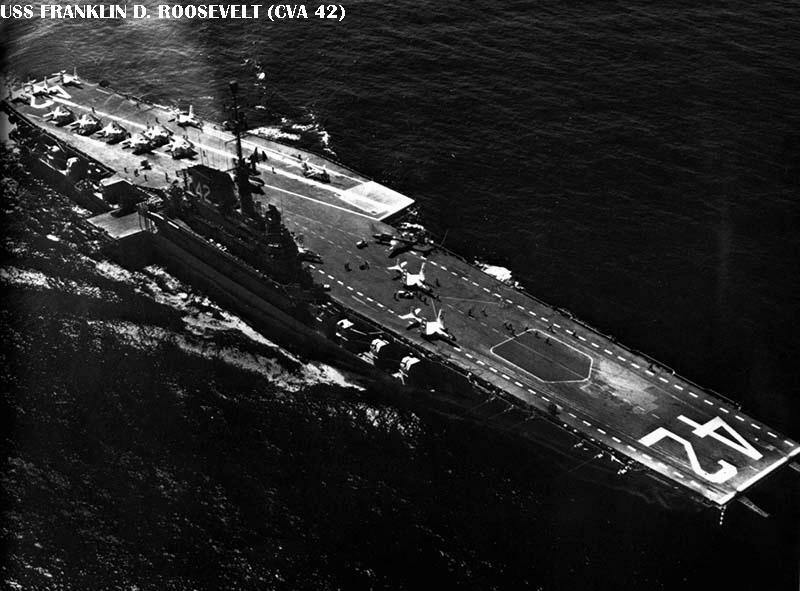 "The aircraft carrier USS Franklin D. Roosevelt (CV[A]-42) underway." From NAVSEA Journal. 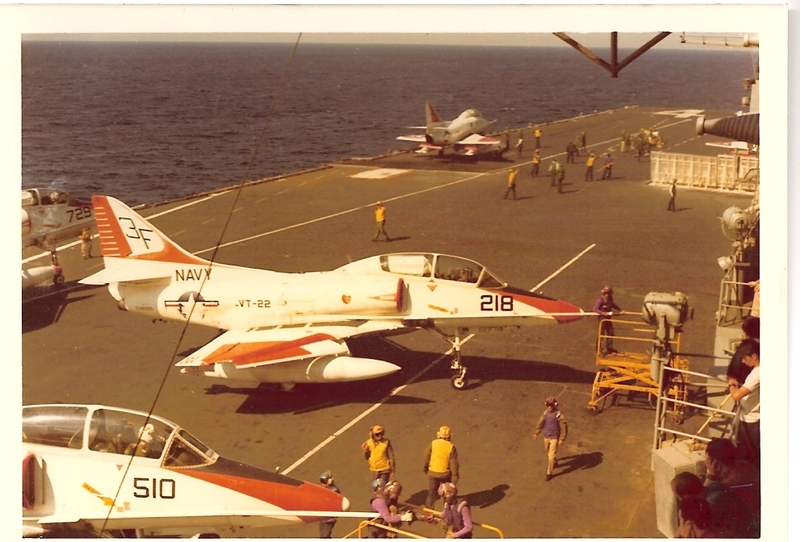 This photo was probably taken at about the same time as the photo above (note plane spotting and flight deck activity). 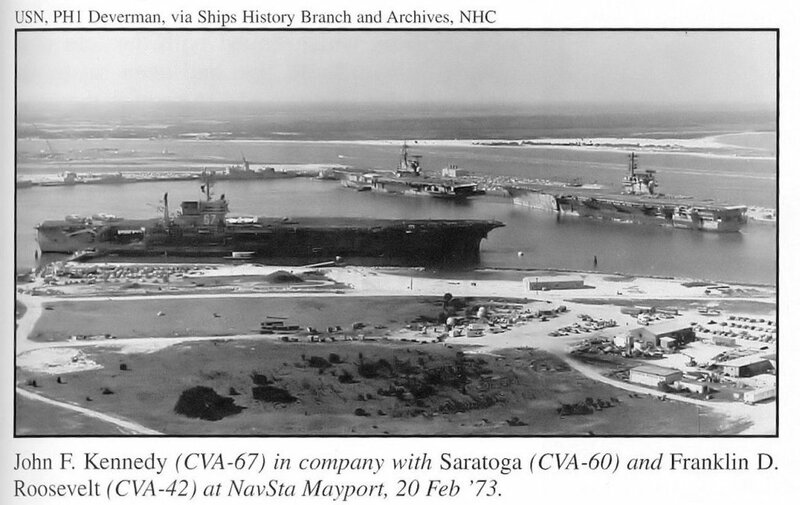 USS John F. Kennedy (CVA-67) in company with USS Saratoga (CVA-60), right, and USS Franklin D. Roosevelt (CVA-42), center background, at NavSta Mayport, 20 February 1973. U.S. Navy photo by PH1 Deverman. 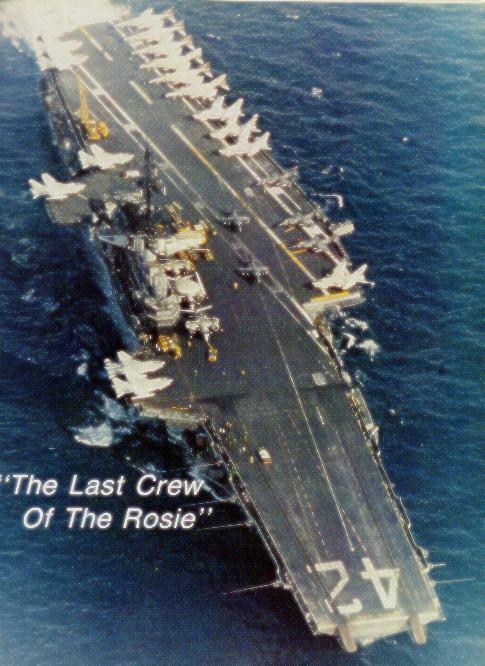 Four photos believed to have been taken in the spring of 1973, off the Florida coast. Aircraft are TA-4J Skyhawks belonging to training squadrons VT-7 "Eagles" (NAS Meridian, Miss., tail code "2K") and VT-22 "Golden Eagles" (NAS Kingsville, Tex., tail code "3F"). 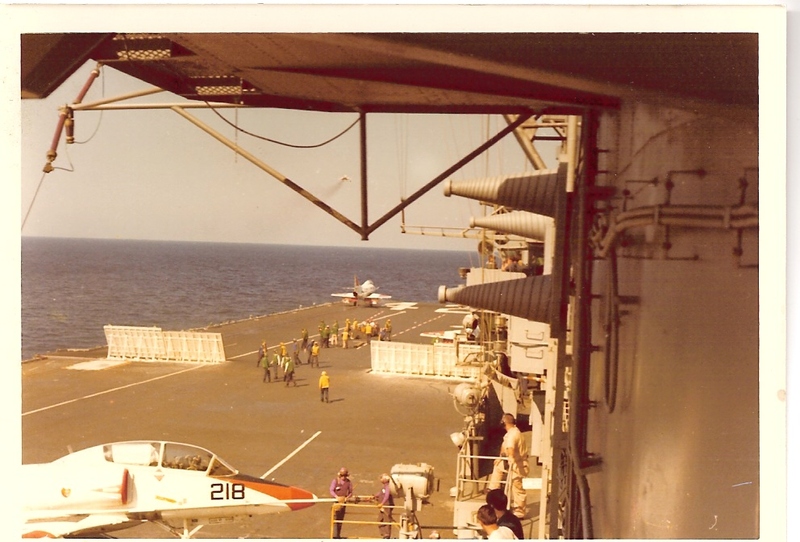 At the time, Phil was working on the flight deck, as the safety Petty Officer for the starboard catapult. 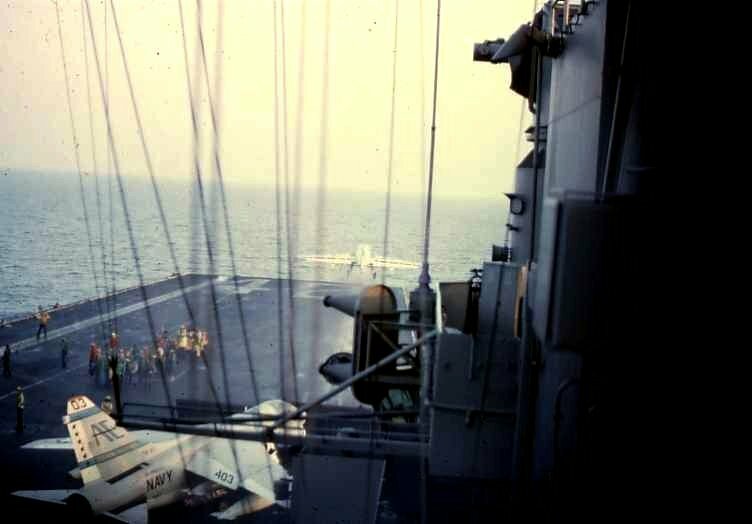 USS Franklin D. Roosevelt (CV-42), 16 or 17 December 1975, Mayport, Fla., as seen from the deck of USS Saratoga (CV-60). 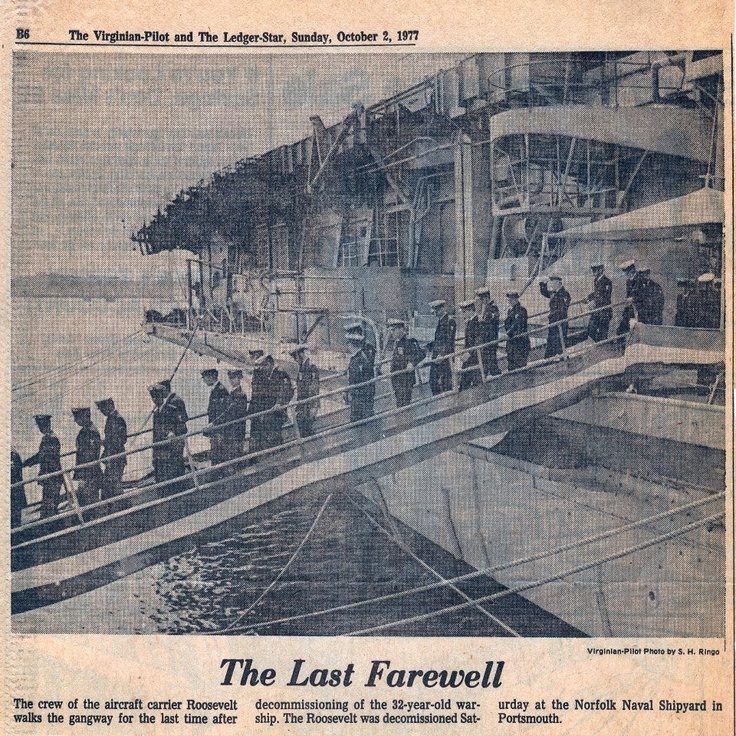 "The Last Farewell—The crew of the aircraft carrier [Franklin D.] Roosevelt walks the gangway for the last time after decommissioning of the 32-year-old warship. 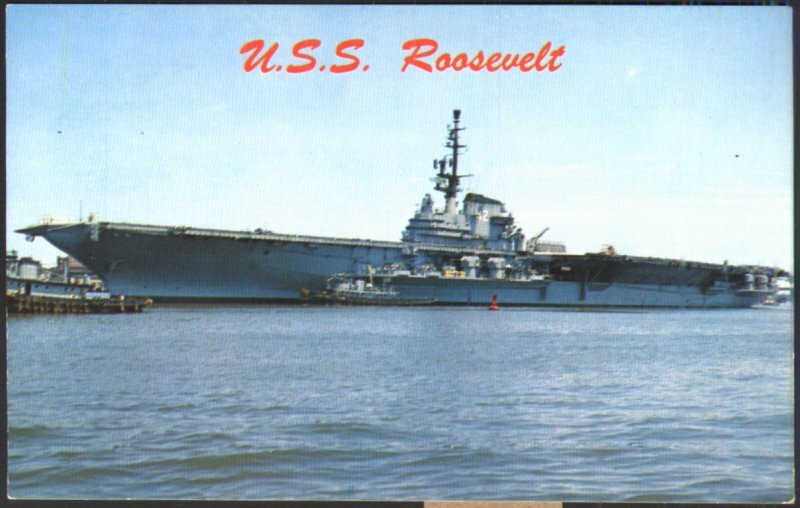 The Roosevelt was decommissioned Saturday at the Norfolk Naval Shipyard in Portsmouth." The Virginian-Pilot and the Ledger-Star, Sunday, October 2, 1977. Virginian-Pilot Photo by S.H. Ringo. 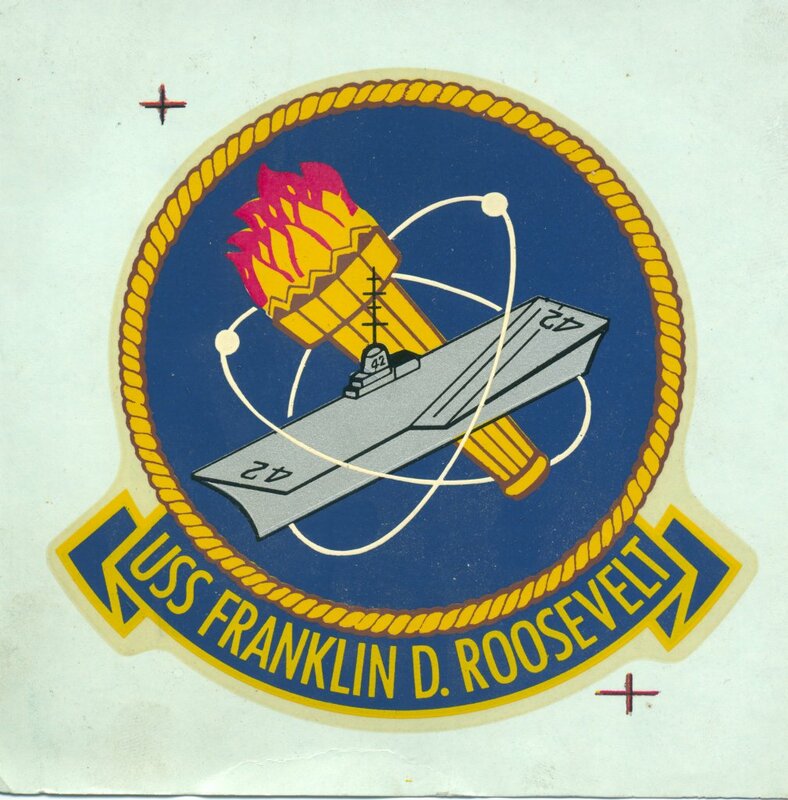 USS Franklin D. Roosevelt. Decal, circa 1967. 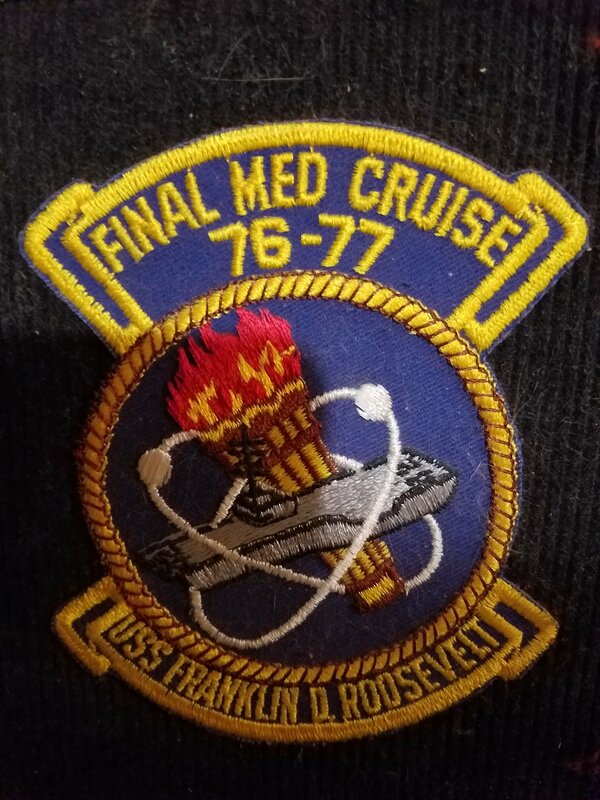 "FINAL MED CRUISE, 76–77, USS FRANKLIN D. ROOSEVELT"
"FINAL FOX, 1943–1977, ATTACK SQUADRON 155"
CAG, Carrier Air Wing (CVW) 19.